The newest entry in the longtime beloved Rocky franchise has arrived in grand fashion. The sequel to 2015’s Creed has produced a sequel that in many respects matches the heights reached by the original. Heading into Creed 2 there were many questions and concerns to the quality of the film with Creed director Ryan Coogler pulling out of directorial duties due to obligations with Disney for a sequel to Black Panther. Franchise creator Sylvester Stallone then stepped up to the director’s chair but also decided to back out of the position. Relative newcomer Steven Caple Jr., best known for the 2016 film The Land, took over directorial duties and more than holds his own. A vast majority of the cast of Creed returns for Creed 2 including Michael B. Jordan as Adonis Creed, Tessa Thompson as Creed’s love interest Bianca and Phylicia Rashad as Mary Anne Creed. 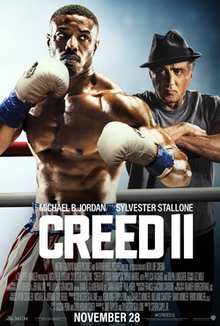 Stallone and Juel Taylor wrote the film’s screenplay giving Stallone the distinction of having written every movie in the franchise sans Creed (2015). The film begins in the Ukraine with Ivan Drago and his son Viktor Drago waking up in their home and heading to a nearby arena for a boxing match. Dolph Lundgren reprises his role of Ivan Drago with Florian Munteanu playing Viktor Drago. The Drago’s are one of the most interesting aspects of the entire film. The movie does a fantastic job juxtaposing the life of the Drago’s in comparison to Rocky after the events of 1985’s Rocky IV. The catalyst for the events in the film is boxing promoter Buddy Marcelle played by Russell Hornsby. Marcelle doesn’t play the typical movie-boxing promoter that is a version of Don King. Marcelle is used as more of a plot device to get the Creed-Drago match made. When the film turns from the Drago’s back to the United States with Creed, we see him getting ready for a major fight with Danny “Stuntman” Wheeler played by former pugilist Andre Ward. The fight with Wheeler is a callback to Creed (2015) where he was knocked out and lost his mustang in a sparring session. Now Creed is facing Wheeler for the heavyweight world championship, which he wins by devastating knockout. While Creed 2 can be seen as somewhat of a sequel to Rocky IV, the film takes most of its influence from 1979’s Rocky 2 where we look at the breakdown and struggle of the main character to be rebuilt into the champion he was always meant to be. Michael B. Jordan gives an exceptional performance playing Adonis Creed bringing new emotional depths to the character. When Creed tells Rocky that he will be taking the fight against Viktor Drago, Rocky refuses to be in his corner for the fight causing friction between the two for the majority of the film’s first and second act. Creed along with Bianca move to Los Angeles to begin training for the fight with Drago. Creed begins training with the son of his father’s (Apollo Creed) trainer Tony “Little Duke” Burton played by Wood Harris. In this portion of the film, it is found that Bianca is pregnant while at dinner with his mother. Phylicia Rashad who plays Mary Anne Creed plays the voice of reason in the film. She doesn't play the over-bearing mother but rather a person that can be relied on for advice and perspective. Tessa Thompson’s character Bianca takes her cues from Talia Shire’s Adrian Balboa who was always there to put Rocky on the right path. Thompson brings about her own plot devices such as her hearing getting progressively worse and it being transferred to her child. The Bianca character never overstays her welcome and only adds to the evolution and growth of Creed. The boxing seen in the film is some of the best in the entire franchise. Viktor Drago comes off as an absolute monster of a man who is believable as the heir to the Drago name. The choreography used for the fights in the film are more realistic than the Rocky film’s of the 1980s, however, they only resemble aspects of a real boxing match. The fights shown throughout the film are shown through the lens of premium cable network HBO. This trend began with 2006’s Rocky Balboa and while it does give the film a sense of realism, listening to HBO commentator and ESPN First Take co-host Max Kellerman will be a chore and at times cringe-worthy for many viewers. Earlier this year it was announced that HBO would no longer be showing boxing on their network thus any future Creed films will have to incorporate the ever-growing streaming market into the movie. The first bout between Creed and Drago in the film is well done with a great emphasis on the impact of body blows on boxers. After Drago gives Creed a violent mugging with knockdowns, he gets hit with a final body shot that brings him to his knees. He is then hit with a devastating punch from Drago that knocks him completely out. Drago is then disqualified for punching a defenseless fighter. The film treats Drago’s heinous and cowardly act of hitting Creed while defenseless as endearing. The Rocky movies have never been about following the actual rules of boxing if so, Apollo Creed would have defeated Rocky by technical knockout within the first few rounds, however, hitting a defenseless fighter is not looked upon highly in the sport regardless of how the fight was going before the foul occurred. Drago would have likely been given a lengthy suspension leaving a rematch in shambles. While the movie ultimately succeeds in making the Drago’s sympathetic figures, it fails at pointing at the disgusting lengths they will go to for victory. The aftermath of the beating at the hands of Drago is when Jordan shines as Creed showing vulnerability to a character that the audience has already seen go through a substantial amount of turmoil. The viewing audience is able to see Creed deal with the same inner demons Rocky did in Rocky 2. The inevitable reconciliation between Creed and Rocky comes at the birth of Creed’s daughter when Rocky makes the trip to Los Angeles from Philadelphia to speak with Creed about what he was going through after his fight with Drago. After the birth of his daughter, Creed eventually agrees to face Drago in a rematch in Russia. The rematch-taking place in Russia makes sense from a film continuity standpoint, however, from a boxing standpoint the only way a champion would have to travel to an opponent’s hometown or country to defend his title would be if the champion were facing someone who is vastly more popular. In the case of Drago and Creed, this isn’t the case. If the Rocky franchise is known for anything, it is known for its training montages. It was likely a good idea to not have Creed train in Russia as Rocky did in Rocky IV, but instead, take a different direction and have him train in the desert. Some of the training shown in the film such as shadowboxing next to a fire is used for its visual effect. The music used in this montage lends itself to the visuals of seeing Creed at first struggle in training to then tearing through his sparring partners and training routine. The juxtaposition between Creed and Drago’s training is similar to the montage shown in Rocky IV with the Drago’s training in a modern training gymnasium and with Creed in the desert. Director Steven Caple Jr. made it a point in the movie to make the Drago’s relatable and have the audience feel empathy for them. Before the rematch takes place, there is a dinner scene in Russia with the Drago’s with members of the Russian elite including an appearance by Ludmilla Drago played by Brigitte Nielsen. The arrival of his mother causes Viktor Drago to leave the table highlighting some of the impact of the events in Rocky IV. The loss that Ivan Drago took from Rocky in Russia made him an outcast in Russia causing his wife to leave him. He alludes to this in the conversation with Rocky in the restaurant when he describes how stray dogs are treated in his country. Ivan Drago is obsessed with getting back in the good graces of the Russian elite, while his son doesn’t understand why they are catering to people who have ignored them for a majority of his life. The film’s final act commences with the rematch between Creed and Drago. The rematch could be the best fight in the franchise filled with ebbs and flows and constant momentum shifts. In here lies, some of the criticism of the film being formulaic and predictable in its events. Throwing in a twist or something unexpected in a movie for the sake of having one would have been a mistake and possibly thwarted the story and direction of the film. At the conclusion of the fight, Creed does a Hulk Hogan impersonation of sorts by getting up from a knockdown and proceeding to lay a beat down on Drago. In a poignant scene, that gives a callback to Rocky IV, Ivan Drago is forced to throw in the towel to put a halt to the fight. At this point, it seems that Drago has realized that his obsession with getting his ex-wife back and using it as motivation was inconsequential to his relationship with his son. For longtime fans of the Rocky franchise, the conclusion of the fight shows a passing of the torch moment with Creed inviting Rocky into the ring to celebrate the victory. Rocky turns down the invitation and instead tells Creed that it is now his time. Stallone can’t play the Rocky character forever, and with Stallone stating that he thought the series would be over after 2006’s Rocky Balboa, it may now be the best time for Rocky to hang up the gloves for good. The final scenes in the movie show Creed and his family visiting his father Apollo Creed’s tombstone. Rocky goes to reconcile with his son played by a returning Milo Ventimiglia and sees his grandson for the first time. The ending serves as a form of closure for both Creed and Rocky as they head down different paths. Should Creed 2 be the final appearance of Rocky Balboa on film it will have been a fantastic send off that brings the character to a fitting end. Rocky Balboa for decades has been a hero and inspiration to a wide array of fans and moviegoers. Stallone has taken his final bow in the ring, and now Creed will continue the legacy of a pugilistic hero for years to come.